No other mid-sized sedan in its class has more leg and head room in the second row of seats, cargo room in the trunk area and scored a perfect five stars through the National Highway Traffic and Safety Administration and the Insurance Institute for Highway Safety for overall crash test standards than the 2018 Chevy Malibu. Also, new for the 2018 Chevy Malibu is the Redline model which to say the least is almost completely blacked out. It has blacked out 19” alloy wheels and the iconic bowtie logo is also blacked out along with a black with red trim nameplate. The exterior mirrors and mean looking grille are blacked out and the only thing that is not black is the “Sandy Ridge Metallic” exterior color. The entire Ridgeline trim is closely related to the LT model just with a few added accessories. The only minor hiccup for the 2018 Chevy Malibu that was made was not putting a backup camera standard on the base model, so if you require one, you need to step up your game and go for at least the LS model. 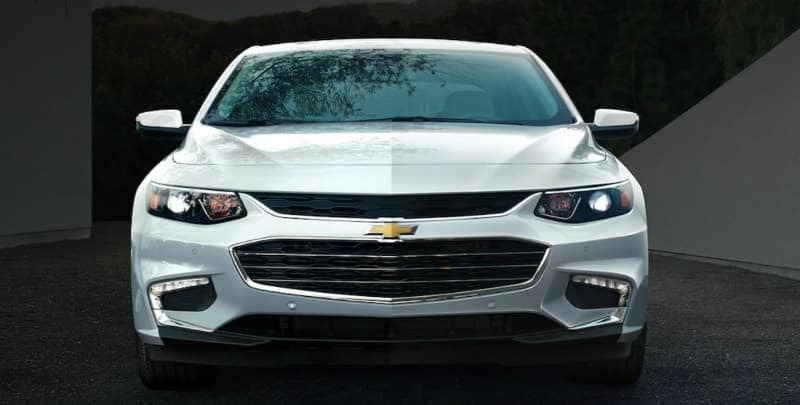 Take the short twenty minute drive from Batavia, IL into Ron Westphal Chevy in Aurora today and test drive the new 2018 Chevy MalibuChevy Malibu. The 2018 Chevy Malibu’s interior has high quality materials that are luxurious and comfortable and of superior refinement and design. The cabin is laid out so everything is within reach and has plenty of storage and ample mobile device charging and connectivity ports to keep driver and passengers well connected while on the go. There is tons of space for even larger people to fit comfortably within the interior of the 2018 Chevy Malibu with ample space for all your cargo. The 2018 Chevy Malibu offers standard safety features such as lane change alert, blind spot alert technology, backup camera with front and rear park assist technology, rear cross traffic alert system, forward automatic braking system with pedestrian braking system, adaptive cruise control technology, lane departure warning system, an advanced airbag system, OnStar Emergency alert system with road side assistance and automatic crash alert system and many other optional safety features available. The 2018 Chevy Malibu also has standard advanced technology features such as teen driver technology with automatic audio mute system, automatic enabling of specific safety features, available data card for parents and instructors, audio and visual warning system, speed control technology and many other features. 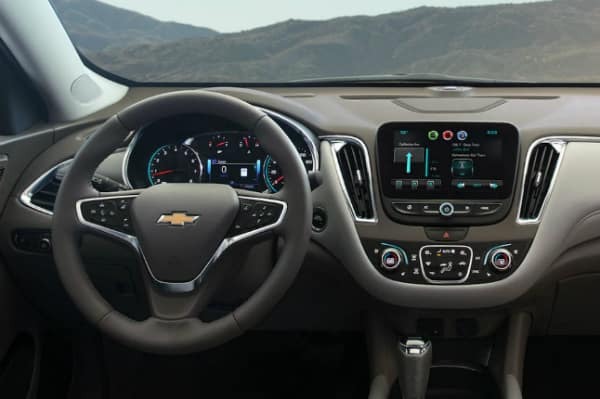 Other technology features include Apple Car Play, Android Auto, wireless charging areas, Chevy MyLink App, 4G LTE Wi-Fi, Bluetooth, backseat reminder system and many other optional package details available. The 2018 Chevy Malibu for more than four years has been the fastest emerging and most bestowed mid-sized car in its class and it may be for its power, drivability and reliability of its three engine options. The first is the 163 horsepower turbocharged 1.5L four-cylinder engine that gets 184 pounds-foot of torque and 27 miles per gallon in the city and 36 miles per gallon on the highway. The next is the impressive 250 horsepower 2.0L turbo engine that thrusts out a whopping 260 pounds-foot of torque while still getting an impressive 22 miles per gallon in the city and 32 miles per gallon on the highway. Chevrolet also dropped a hybrid 1.8L four cylinder coupled with a lithium ion ran electric engine and a Continuous Variable Transmission (CVT) into the 2018 Chevy Malibu, which has tremendous gas mileage getting 49 miles per gallon in the city and 43 on the highway. 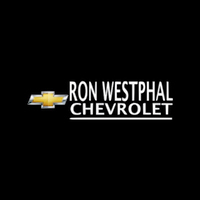 Our finance team works hard to save each of our valued customer cash off the price of their purchases with Ron Westphal Chevy by offering great lease and finance specials combined with regional manufacturer incentives.